Such a relief from the cold, bare, gray, modern churches we had to endure for many recent decades. My husband and I always go in and look at the Greek Orthodox church (Annunciation) when we attend the Dayton Greek Orthodox Festival in Sept. The church is open for public tours that weekend. For great ecclesial beauty, I recommend this to everyone. It seems like our RC churches are going that way again. 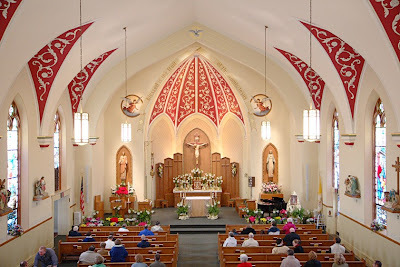 A beautiful church is a wonderful way to give glory to God, and a way to call our human minds to greater realities than we are necessarily absorbed in during our workaday lives. 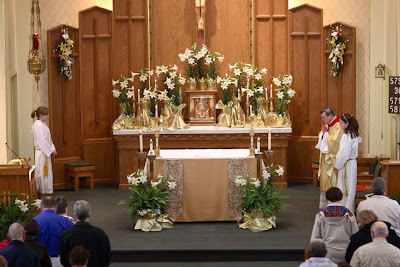 I like it when the altar "vestments" are of the same fabric (literally) as the priest's vestments. It reminds me that the altar is an icon of Christ, just as ths priest is. It's similar to the funeral pall "clothing" us in Christ. Great job bringing beauty to these Sanctuaries, Father. I wonder, though, if you have any photos of these two Sanctuaries before they were "modernized", i.e. 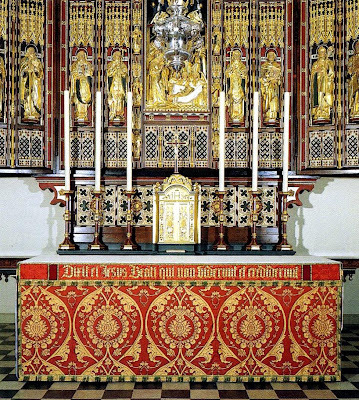 photos with the old high altar, side alters, statues, etc. I know most of the elaborate altars in these beautiful old churches were removed and burned in the 60s and 70s and replaced with wooden walls. Hi Fr would you mind updating to my new blog? Many thanks..
Would it be possible to get a larger altar for St Marys? Oh My what beautiful churches! And the altar arrangements are quite well done, too. Good Eye, Father! Thanks for sharing those pictures. I have been wondering what your parishes looked like for some time. I echo the sentiments of other commenters on the work you have done on the furnishings, but wonder if work is being done with respect to altar girls vested in albs? I'm sorry, I don't get what your point is. The altar servers are wearing albs. What would you recommend they wear? Both Sanctuaries exude holiness and reverence. Should one (or both) of these young ladies (with their parents present) express a heartfelt desire to you to pursue the priesthood as a result of their so closely assisting you at the altar, what would you say to them? I'm referring to the picture showing the young ladies assisting you at mass. Sorry about that. 1. I would explain the Church's teaching that Christ created the priesthood as male-only and the Church has neither power nor right to alter what Christ has ordained. I have had this conversation before, and will, many times, unrelated to the question of girls as servers. 2. I infer that think girls as altar servers is a bad idea, because I don't see why you would ask the question, in this context, if you thought it a good idea. For whatever reason, you chose not to spell that out. Girls as altar servers is the reality we have to deal with at this point. A pastor "can" change that, yes he can, as easily as mashing a button, so why doesn't he? Because what a pastor cannot do is make such changes affecting the life of the parish, yet somehow cause there to be no consequences, no ripples, no reactions. So I find it amusing--when I don't find it irritating--when people are ready to insist a pastor mash those buttons--that one, that one, and this one too--as if the after-effects were no matter whatsoever. Especially as the practical effect of following this approach is that a pastor will commit himself and his resources to a messy battle over a relatively small matter, and as a result, make any number of much more significant accomplishments less likely. Someone wise once taught me, "keep your eye on the main chance, don't stop to kick every barking dog." You're churches are beautiful. Ours is a bit on the modern side. As part of the Liturgical Committee (a silly innovation IMHO), my husband and I will be gently pushing for an altar cross and candles. It was a sincere question, especially in light of the Holy Magisterium's recent directives (again) concerning women priestess. I wasn't asking about your discretion to not allow young ladies to participate as altar servers and thus cause ripples in the parish. Only what your pastoral approach would be when that moment comes when a young woman tells you that she feels she has a calling to the priesthood. I think you read into this a little more than was necessary. My mistake, and I apologize. I have no idea what "mashing a button" is. or somehow along a spectrum towards ordained priesthood. Priesthood has its own integrity, as does the lay vocation - one does not slowly drift towards the other. then that raises far more significant issues! "mashing a button" is Southern for "pushing a button." I'm not southern, but I lived in Vuh-jinya for several years, and travelled in the south, and picked up several expressions I liked, that's one of them. I did not intend my comments to address the relationship between serving at the altar and the priesthood, and I do not wish to delve into that in this thread. I would delete that comment, but it would make Ohevin's response not make sense. Wow, beautiful pictures! I wish we built them like that again!